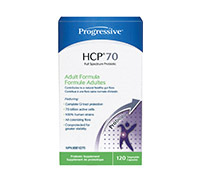 HCPÂ®70 (Human Colonizing Probiotic, 70 Billion Cells) is a full spectrum probiotic supplement featuring 6 human strains that strategically implant healthy flora throughout the entire digestive tract. Consideration was also given to ensure oral and vaginal probiotic health. HCPÂ®70 has also been cryoprotected and a family of stabilizing support nutrients has been added to help ensure the viability of the flora. It is also free of dairy and plant sourced strains that are transient in nature and fail to colonize within the GI tract.